Trip 110, Sanibel by air. At the airport ticketing place they said our seats were changed, no reason, but they were right up front behind the business class. I didn’t think that was bad until later when Nan Lou said they might be behind a bulkhead and have less leg room and no storage under the seat in front. I checked at the boarding station and was told there was more legroom and no bulkhead. For Air Tran the seats were wonderful. It was a short flight, two and a half hours or so, to go 1100 miles. I can’t believe that, but it’s true. We had leg room to spare. I wish we could have the same thing going back. I couldn’t believe it when I looked up and saw Joy Lucas-Brown at the baggage carrousel. Small world. We got a little Nisan Versa rental and it seems like a pretty nice little car. The guy at the rental place went to Heritage Christian School and Butler U. Talk about small world. He gave us a map that helped find breakfast. First Watch is the chain that just opened in Indianapolis. We tried their specialties in Indianapolis and decided we didn’t like that restaurant. We decided to stay with good old tried and true breakfast fare and we enjoyed it a lot. Perhaps the fact that we were starving by that time had something to do with it. That is not a sunset. It is a sunrise. Totally ridiculous to have to see it. Seats 10A and 10B on a Boeing 717 have great legroom. We were not supposed to get into the condo until three. We were exhausted and they let us in at one. We hopped into bed and slept like logs until about five. We couldn’t believe it but we were hungry again. We hit CheeBurger CheeBurger and had one of their mighty fine hamburgers with blue cheese and a malt with sweet potatoe fries. We wouldn’t dream of counting the cholesterol after that meal. We went down to the light house and had to pay two bucks to go walk on the beach for twenty minutes, if that. I don’t ever remember seeing the lighthouse lit before. It was nice just as it was getting full dark. This is our 48th anniversary. We had a bagel at the Sanibel Bean, the local Panera’s or Einstiens around noon. After eating we went to Bailey’s to stock up on stuff. We didn’t need much since we plan to eat out at all the good local eateries. Little did we know. It was pretty hot so we went back to the condo and figured out where we would have our anniversary dinner. Nan Lou lobbied for the Mad Hatter but I wasn’t too enthused about their menu selections on the web. Anything on Captiva was out since there wouldn’t any place to park. Finally we decided on the Timbers, one of the oldest and well-known restaurants on Sanibel. When we arrived it wasn’t a bit crowded. We were a little early since we had planned to spend a little time in their raw bar and eat oysters from the polluted waters of the Gulf. Since it off season the raw bar was closed so we went immediately to the restaurant. Their menu didn’t look too bad and we asked the waitress for her recommendation after she gave the spiel about all the fish, their specialty, being local. The Scottish Salmon must have swam all the way around the Florida peninsula to be caught in the local waters. Of course she said the Grouper was the best. Strangely it was also the costliest. What the hell, it’s our 48th so we each had it. The meal was memorable for its mediocrity but we had a good time and a piece of deliciously tart key lime pie. Of course some prefer a sweeter pie. After eating we went exploring to where the houses are so big and hidden by jungle growth they are all but invisible from the road. We looked at them later on Google Earth and saw that they really very big and closer together than we thought. Before calling it a night we went to Pinocchio’s ice cream parlor. We sat outside, there is no inside seating, until little biting bugs told it was time to go. Hey you are my ONE true love; and, don’t you forget it. It was a super anniversary. Number 48 at The Timbers. I had toast and one egg, feeling the need to undo the gluttony of yesterday, while Hammie had a full breakfast. His eggs were not cooked to the “over easy” specification that he gave them. All in all it did not rate well by even Indianapolis standards. It is very near the end of the road so we paid the two dollar fee one more time so we could walk to the beach. I had forgotten that the beach (ground shells) was all stirred up and was difficult to walk in, but not as bad as Michigan sand. We walked down the beach a ways while I got weird looks with my long skirt, big sleeves, and floppy hat. Enough of that. IT WAS HOT. Ham finally admitted that all his griping about Hawaii was due to the fact the condo didn’t have air conditioning. He also admitted it was hotter here. Whoa! He remembered the nicely placed Starbucks I had spied before we left Captiva. So, we both had giant decaf soy lattes and I finally quit glowing……that is perspiring or sweating, you know. We got back to the condo and climbed the 21 steps again. I hope before we leave I can do that without huffing and puffing like little Toot at the top. We washed our sandy feet stripped off the clothes and lay down. Ham fell asleep reading and had a nice nap. Of course, while waiting for him to wake up, my fruit plate wore off and I got hungry. I patiently awaited an appearance by my one true love and since it looked like sunset, we decided to take a beach walk here by the complex. “It’s about time,” you might say. The clouds were pink and pretty and the tide was out and it was just a beautiful evening with gentle breezes. Birdy, or as some call it, a Brown Pelican. We loved the architectural wonders and the figural sculpture of the sand castles. Things have certainly become more creative in the past few years. Fun to see. Ham decided to feed me, so it was a trip to Huxters deli for chow. I enjoyed the Triscuits and cheese and banana. Much better than anything at the Dairy Queen. I don’t suppose friend Bob Would agree. We were and out about 11:30 and headed for a new restaurant, to us, called Over Easy Cafe. Their ad in the paper said it was a wonderful place. It was crowded. There was a nice outdoor area that was full and a nice indoor area which also was full. Nan Lou said it was too hot for outside and I thought the inside was nosier than Panera;s at home. We stepped inside to await the hostess and moved in so a party of 3 or 4 could also get in. The hostess finally came and promptly took care of the other people. I was pissed and said let’s go. On the way to the car NL said she would have mentioned that oversight to them. So unlike my usual quiet self I went back in and told the manager and hostess about it and they said they were sorry. Of course with a full house they didn’t care about two unhappy customers. Hell of a way to start the day. I will say that the other party just might have mentioned that we were there first. But they were probably people from the east coast or Ohio. We went to the good old Sanibel Café and had a better breakfast than that yesterday at the Lighthouse where their sign proclaims that they are the best in the world. Will I ever learn to ignore all that I read? Later we drove around the private houses on the bay side and were awed at the size of some. I’ll bet that 99% of them are winter homes. By then we were thirsty and getting hungry. We were thinking more about something cold to drink than eating. Nan Lou even mentioned the local hot dog place where we could get cold wet stuff and maybe a wee bite of something to gnaw on, but we had missed it along our path of exploration and after much thinking ended up at Doc Ford’s place on the road to Captiva. Being a fan of the Doc Ford books we figured we would eat there sometime. Perusing the menu we decided on a dozen oysters from the raw bar. We liked them so much we had a dozen more. To top it off we each had a piece of key lime pie and thought it was good, but not as good as the Timbers KL pie. NL even said that the Timbers pie was now the standard all other key lime pies will be judged against. NL says that the oysters were the largest we have ever eaten. Holy cow Batguy, I’ve turned the log into a restaurant review. Too terrible for words. We stopped at the campground to look it over and check prices for the winter. On our driveabout we stopped at their big aviary full of parrot like birds the names of which I cannot recall. NL will tell you though. By then the clouds got serious and the temperature was pushed down by a briskly blowing wind making it perfect for a beach walk. On our walk we found no exotic shells but did find several just plain old pretty ones. All I have to say is the campground is nuts, the prices, that is. You could buy a very nice house for the price of the mobile homes and you have a 6 to 7 thousand dollar yearly space rental fee on top of that. The birds (macaws and cockatoos) were friendly and allowed people to pet them and the ducks of all kinds, black swans, etc. were beautiful. There were mammals such as ringtails (lemurs) too but we didn’t get out to look at them. It was a neat, well cared for mini zoo. It was not worth the cost of staying there though. To stay in your rv for a month cost as much as a condo. Go figure! Well, maybe not as much. For some reason I was really sleepy this AM and Ham let me sleep without rousing my lazy self out of bed. So by the time we hit the breakfast restaurants the hoards had moved in. We wanted to try the Island Cow. It was packed and we knew we would have a wait, but not only that but we missed the breakfast by a half an hour. Bah Humbug! So we went down to the Bean for a bagel. Had to sit in the unairconditioned part but with the fans whirling away, it really wasn’t too bad. We chatted with a couple from AK and sat next to some Hoosiers from Bloomington. Ham bought the biggest fruit cup in the world. Not too bad for only three dollars. When we came back for rest and more, it started to rain….really pour. So we went out on the balcony (lanai?) to watch. The temperature had fallen and it was quite pleasant. New people moved in next door, so we chatted with them a bit. They were much nicer than the ones who left. They would fall down the stairs rather than make eye contact, let alone speak. After our short rest we went looking for some art galleries. There are a couple on Tarpon Bay road near the Timbers. One was closed and one was open. There were some very nice photos and paintings, etc. We found a small glass plaque for Tachou’s birthday. One gift out of the way. When we were sitting, Hammie decided a good old Italian spaghetti Marinera sounded good. Sanabel has a dearth of ethnic restaurants, but there was one not to far from the condo called Matzaluna. I was just going to have a bruschetta but by the time we got there I was hungry and Ham remembered I used to like aglio oleo. It was great. We brought enough home to have dinner tomorrow night and a piece of, what else, tiramasu. I had dribbled grease down my shirt of course. I should start carrying my own bib like a baby. We went down the street to Jerry’s to get a Tide pen and to check out the Jerry Restaurant that the new neighbor recommended. Ugh! No ambiance and the prices were as high as anywhere else. We won’t be going there. We got up about 10 and made it to The Cow restaurant for breakfast before 11. Being Sunday they served breakfast until noon. It was pretty good. We had to wait 15 minutes but we happened to be standing near a couple who were called and we got their chairs. I was over fed and we went back to the condo and spent the afternoon resting (sleeping). So much for the beautiful beaches and nice sunny day. Today was cruise day which meant the alarm was set at an ungodly hour. We left the condo a few minutes before our goal so we were on the right track. We actually had time to stop at the Bean for a bagel and decent coffee. There weren’t too many cars on the road to Captiva where the gatekeeper directed us to the proper parking space. Then we couldn’t find where the trolley stopped so we went back to ask the same gentleman. He directed us to the stop very near the gatehouse and we settled on the bench and in very few minutes, here came the trolley. Ham got our tickets and we stood in line a short while to board. A young girl in a wheel chair and her extensive family was permitted to go first. On our way at last. The little keys were in the near distance and I was surprised to see most of them had large, expensive houses on them. Gee; whatever happened to the little beach shack get-aways of yore? After about an hour of cruising, we docked and right away noticed more stairs to climb to get to the restaurant. We were taken to a window table at the rear of the restaurant by going through the “Money Room” There were two of these rooms actually. Dollar bills covered the ceiling and walls and all available surfaces sometimes many bills deep in layers. They were taped together and hung down like streamers. It wasn’t a pleasant sight, but it certainly was more and different from the usual dollars taped over a bar. We ate peel and eat shrimp and then took a little walk. I spotted a big univalve which Ham confiscated for me and it turned out to be an intact tulip shell fossil. It needs cleaning but I consider it a real treasure and souvenir of the cruise, if not the entire week. We sat in a couple of Adirondack chairs in partial shade until the boat returned. The young girl was carried around by her brother, I think, and it was so nice seeing how the family helped her to see everything there was to see. The only really interesting thing on the way back was the promises of the captain that there is almost always a dolphin sighting. Then someone would exclaim a sighting and everyone rushed to the rear of the boat just to be disappointed. We wondered if that ruse was used on every sailing. The top deck of the Lady Chatterley, oops, I mean the Lady Chadwick. Anybody here remember Lady Chatterley? the islands. He is definitely eyeing the Sharp looking woman. a good sense of humor about those nonexistent critters. Back to pick up the car and we were both pretty tired. I figured it was better to eat before we returned to the condo than to go back and then climb those stairs two more times before settling in for the night. Ham was feeling a bit yucky and wasn’t hungry. We went to Grandma Dots on the marina and he had a small cup of clam chowder which, we later learned, was not a good choice because he got to feeling worse and it lasted for several days. We returned to the Island Café in the Tahitian Gardens Shopping Mall for breakfast. I never understood how restaurants can ruin an egg or French toast, but they do. My toast was hardly edible. This used to be one of our favorite places to eat. I wanted to go through the shops in Pelican Place. I didn’t realize it was so huge, so as usual, I didn’t have the energy to do the whole thing. Back to the condo to climb the stairs AGAIN then to start packing! Looking at our things spread so thinly about the whole place, I wondered how we could ever get it packed up. We persevered and got everything packed and the condo straightened up with just our travel clothes laid out and ready. A little rest (nap?) was in order then. We returned to the Island Cow in the late afternoon and, lo and behold, there was no long line and we were seated immediately. Ham had pulled pork sandwich which did nothing at all to help his tummy. It was certainly unusual to have to climb 21 steps in order to rest, but that we did. I was exhausted, as usual. Ham had a bad stomach, as usual. 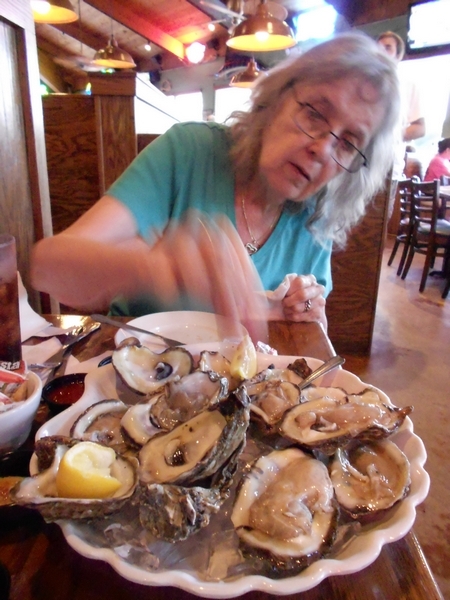 The UTI and antibiotics were working on my system and the oysters? clam chowder? pulled pork? were working on Ham’ system. What wimps we are! After a bit Ham said something about a last beach walk and I thought, “Are you kidding? Are you nuts?” Then, I was filled with remorse thinking, “Who knows when we will be back, if ever?” So, I said, if we can drive down to the Lighthouse parking area, let’s go. At least you didn’t have to walk a quarter of a mile just to get to the beach. The temperature was terrific and the Lighthouse was flashing. I was so glad we went. Then the show started. First the clouds became tinged with pink, then there were pink cirrus clouds swooping across the sky and, at last, the western sky blazed in brilliant reds and fuchsias. We got to the car and just sat there enjoying it. It was a long lasting sunset too. Wow! Did that ever make the evening’s trip to the beach worth while. The alarm went off at an ungodly hour. All we had to do was wash and jump into our clothes. It broke my heart having to leave an almost full bottle of Bailey’s orange juice. But, so be it. We breakfasted at the Bean and it was nice to say good bye with a really good cup of coffee in our tummies. Returning the car was surprisingly effortless. We even had no trouble finding the airport and the Economy return place. There was a curbside check place which we used and asked the guy if we could have the row10 seats we had on the way down. He said, “No. They were occupied.” We went inside and Ham asked at the regular ticket counter. The seats we wanted were not available, but the middle and window seat right across was. So, we got those. They were so much better with more leg room than the regular seats. Not as good as the ones we wanted, but good. The funny thing was that the man sitting next to Ham in the aisle seat was with the lady who had “our” seats. She occupied both seats all by herself. We finally figured out that this couple had purchased three seats so she could sit alone in this very roomy two seat row all by herself. Her husband didn’t sit with her once. Of course the return flight was only two hours.